I have a weakness. It is sugar cookies. Glorious sugar cookies. I avoid them at all costs. But not just any sugar cookies. The only ones that are truly irresistible, are the ones topped with buttercream frosting (and real vanilla). All of my will powers are weakened in the presence of a soft sugar cookie slathered with homemade frosting. Actually they aren't weakened, they are totally diminished. In the end, there is nothing left to do but give in and eat the problem. Lately I have been trying to eat healthier and exercise a bit more and I have been quite proud of myself. Until that fateful day when Miss B decided to bake up a batch of sugar cookies. I pleaded with her to make something else, for I know my weakness well. But she was not to be deterred from her goal. So with anticipation/trepidation, I whipped up a bowl of buttercream frosting with the most lovely Mexican vanilla you have ever tasted. It truly makes everything better. And at the first lick, I knew I was toast. I'm a sucker for sugar. Especially when it's mixed with butter and vanilla. I tried to steer clear of the cookies and I did swimmingly for the first day. But then the next day dawned and the rest is a blur. Somehow I made a new batch of frosting, and about 7-8 heavily frosted cookies shoved their way down my throat (with a little help from me and a glass of milk). I'm pretty sure it was me that licked the frosting bowl clean too. And then I was ill. But it was glorious for those few sweet moments. And today I did not eat a single sugar cookie. But that is entirely because there are none left. I do not think I would have been so successful had there been any cookies left lying on the plate and begging to be eaten. Because they are extremely persuasive and so convincing. None of my arguments work against their charms. 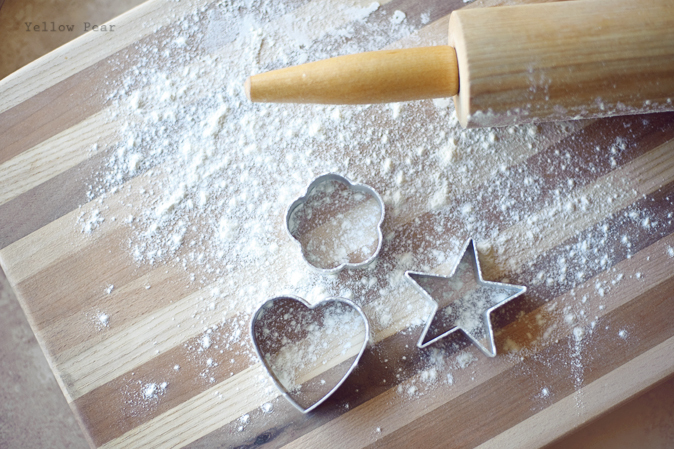 Blast those charming and delicious cookies. They turn me into a weak and spineless cookie monster. So if you ever need to make my day and/or make me ill...bring me sugar cookies with homemade vanilla buttercream frosting. And I will love/curse you forever. Ahahahahaha!!! I can't resist sugar cookies with buttercream frosting either. They are the only dessert I can't say no to. Only cookies homemade by me, though. So I don't make them anymore. It's sad, really, because I have the whole recipe/process perfected. But seriously, if there are homemade cookies in the apartment, that is what I will eat for every meal and snack until they are gone. And now I am craving them. Thanks. Lou, I am still waiting on those wedding pictures... !